Euro Truck Simulator 2 is a popular game which main idea is to put you in the driver's seat of the truck and throw you into the world of cargo trucking. In this game you earn money transporting goods from point to point, like typical trucker. The game's world allows you to travel all over almost all of Europe, and mods allow you to expand the world even more. But it isn't a pleasure to drive the same truck every time. Original truck you given is the worst, it will eventually break down, jobs will requiere less transportation time, and any violations of the rules will reduce your budget even more. I.e. you can't deny spending you money. And again, the slow and not the best truck is not as pleasant as we would like. But what to do? 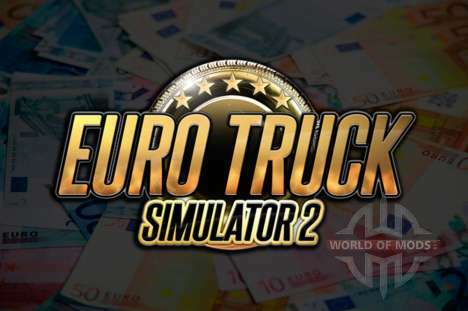 It cannot be denied that in Euro Truck Simulator 2 money plays a huge role, and earning them long and hard. You can find help in our article, which describes the simplest ways to make fast money in Euro Truck Simulator 2. Trainer is a program that manages the data of the game, manipulate them for your benefit. So in many complex games can become immortal or turn off AI of opponents. And for Euto Truck Simulator 2 was created by my assistant in sensitive situations. Euro Truck Simulator 2 trainer highly improves Your in-game life. First, it allows you to add as much money in the game as You want that Passaic to buy any truck and to pay off any offences in the game. Also the trainer will allow You to save in the game time to sleep, clean up the damage from the collision, will allow you to get more in-game experience and so on. To activate abilities of the trainer Euro Truck Simulator 2, you need to press the appropriate keys game. 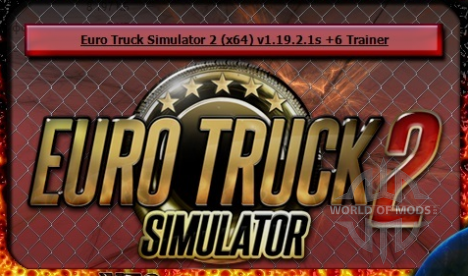 Trainer Euro Truck Simulator 2 need to open to run the game. The trainer is certainly good, but not everyone will be able to deal with it or for someone it will not work. To avoid such misunderstandings, we bring you another way to get easy money in Euro Truck Simulator 2. 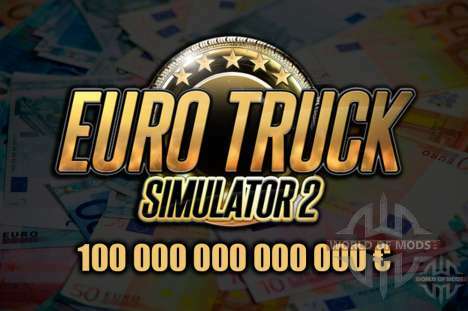 You can download mod for Euro Truck Simulator 2, which makes you extremely rich. The essence of mod is simple - it just adds to the game 100 000 000 000 000 000 euros, which can be considered an unlimited amount of money. The problem with this method consists in two points, in comparison with the trainer Euro Truck Simulator 2. Here it is impossible to choose the amount of money you added to the game, i.e. if you want less money - nothing will come of it. The second point is that for mod - you need to start a new game, old saves will not work. But this problem is not so important, because huge capital in Euro Truck Simulator 2 going to narrow this gap.